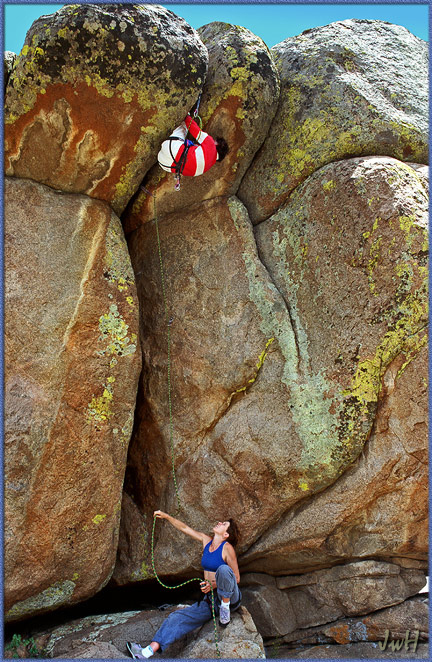 One of the prominent climbing areas ‘outside’ Greater Vedauwoo is the Roof Ranch. This set of odd formations is known primarily for a classic, overhanging, hard offwidth called ‘SQUAT’ (12b). Certainly following the first ascent by Bob Scarpelli back in 1983, yes that long ago, Squat became ‘the hard offwidth’ testpiece for quite some time, and it is still regarded as one of the best lines of its kind found anywhere. Now there are several more climbs of competitive difficulty as well as others at a lesser grade, each quite unique and different from one another. This place is one-of-a-kind, not to be found elsewhere. It has become a magnet for all highly skilled offwidth fanatics and they just keep coming. It is a veritable gold mine of very hard, overhanging creations. See if you measure up to the challenges found here. Some have walked away from this place feeling they’ve done something quite extraordinary while others are sent packing with their tail between their legs. Which one are you? Go ahead, try it out and you will find out. The image above is Craig Luebben using only 2 big bros for protection, inverting for demanding purchase while setting a double handstack as he ascends this crazy hard, ‘squat’ testpiece. Cuba, Africa, Mexico and more.